Review the IME tutorial video and the IME instructions for Cantonese . The IME instruction document will be available to you during the actual test. For the Pedagogical Content Knowledge section of the test, you will write a response of approximately 400–600 words in English to an assignment. Read the assignment carefully before you begin to write. Think about how you will organize your response. You should use your time to plan, write, review, and edit your response to the assignment. Your final response must be typed in the on-screen response box presented with the assignment. Please note that, if needed, you will be able to type words in the target language in your response using Input Method Editor (IME) technology. You may access specific instructions for IME use by selecting the button above the response box. Your response will be evaluated on the criteria above, not writing ability. However, your response must be communicated clearly enough to permit valid judgment of your knowledge and skills. Your response must be your original work, written in your own words, and not copied or paraphrased from some other work. Be sure to write about the assigned topic. Remember to review what you have written to ensure that you address all aspects of the assignment and make any changes you think will improve your response. Use the information below and the exhibit provided to complete the assignment that follows. You are planning instruction for a Cantonese language class. Your instruction includes a specific learning goal aligned to the following New York State Learning Standard for Languages Other Than English. Standard 1: Students will be able to use a language other than English for communication. You will use the exhibit provided as part of your instruction. To view the exhibit, click the "Exhibit" button on the right above the response box. describe an effective formative or summative assessment tool, strategy, or activity you would use to measure student achievement of the specified learning goal. To view the exhibit, the examinee will click the Exhibit button. The pop-up window can then be resized and/or repositioned on the screen so that the examinee can access the information while completing their response. 400. Chinese food, Sweet and sour fish. Collection: Moment Open. Getty Images. Chua, Jowena. Wonton Soup. Collection: Moment. Getty Images. Ingelhart, Robert. Strawberry Chocolate Mousse with Whipped Cream. Collection: E+. Getty Images. Sillaste, Kelly. Crepes with chocolate sauce. Collection: Moment. Getty Images. This exhibit is an appropriate resource to use in a high school Cantonese class at checkpoint B. The specific learning goal is for students to communicate in Cantonese by making plans to go to a restaurant and expressing food and dining out preferences using previously learned phrases such as 我钟意食......， 唔钟意食......。 我想食......， 唔想食......。 Students will already be familiar with some of the food vocabulary and phrases used to order in a restaurant. 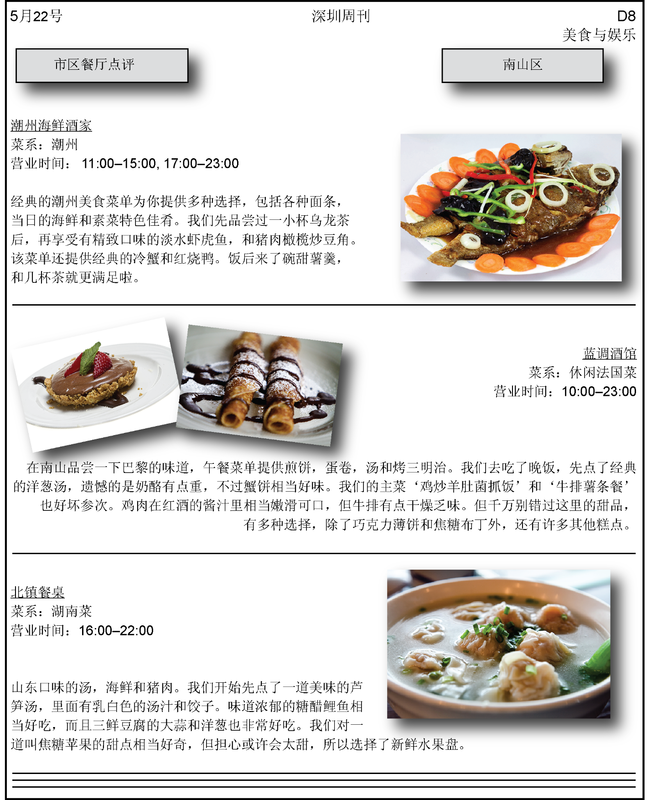 The rationale for this goal is to expand the students' range of food vocabulary and ability to make dining out plans in Cantonese. First, I will assess comprehension of basic food vocabulary using flash cards and asking students to name the food represented on each card. While doing that, I will help them with their Cantonese pronunciation as needed. At the same time, I will introduce the grammar of likes and dislikes by asking a few students if he/she likes this food or not. 你钟意食......吗？ 你钟意食咩菜？ The students should answer me with 我钟意食......， 唔钟意食......。 After I do that with all the vocabulary, I will let the students play a vocabulary Bingo or matching game to get more familiar with the new vocabulary. The next day of instruction, I will display the exhibit and vocabularies on the big display screen (PPT, or Smart Board, etc.) First, I will ask two students to come up to the board to point to the vocabulary that their classmates say out loud. This instruction will help the students who are at the board to practice their listening and reading skills, and the students who are sitting and giving instructions, to practice their speaking and reading skills. Then, I will ask one student in class the same four questions we did in the previous class, 你钟意食咩菜？ 你唔钟意食咩菜？ 你想唔想去食......菜? I will then take out the brochure (exhibit) and demonstrate how to expand the conversation to make an arrangement to have lunch or dinner together by asking what time should we meet? (你听日得闲吗？ 我哋一齐去食晚饭吖？) and which restaurant should we go to? (哩间法国餐厅睇落唔错，我哋去试吓吖？). Once the demonstration is done, I will ask everyone to pair up with a partner, and arrange a dining date together. I will give students fifteen minutes to practice, and then they will demonstrate their dialogues one pair at a time. The rationale of this activity is for students to use what they just learned in a simulated real-life situation so that they are ready for a future real-life similar situation. As an assessment, I will have each student write a short email to another student, inviting the student to go out for lunch or dinner and proposing two choices of restaurant. Then each student will respond by accepting the invitation, indicating the restaurant that they prefer, and providing a rationale for their choice (such as what food they are looking forward to eating at the restaurant of their choosing). Students could also expand the rationale if they wish to do so. Their emails should cc me, so that I can keep track of the progress. This exhibit is an appropriate resource to use in a high school Cantonese class at checkpoint B. The specific learning goal is for students to communicate in Cantonese by making plans to go to a restaurant and expressing food and dining out preferences using previously learned phrases such as 我鍾意食......， 唔鍾意食......。我想食......， 唔想食......。 Students will already be familiar with some of the food vocabulary and phrases used to order in a restaurant. The rationale for this goal is to expand the students' range of food vocabulary and ability to make dining out plans in Cantonese. First, I will assess comprehension of basic food vocabulary using flash cards and asking students to name the food represented on each card. While doing that, I will help them with their Cantonese pronunciation as needed. At the same time, I will introduce the grammar of likes and dislikes by asking a few students if he/she likes this food or not. 你鍾意食......嗎 ？ 你钟意食咩菜？ The students should answer me with 我鍾意食......, 唔中意食......。 After I do that with all the vocabulary, I will let the students play a vocabulary Bingo or matching game to get more familiar with the new vocabulary. The next day of instruction, I will display the exhibit and vocabularies on the big display screen (PPT, or Smart Board, etc.) First, I will ask two students to come up to the board to point to the vocabulary that their classmates say out loud. This instruction will help the students who are at the board to practice their listening and reading skills, and the students who are sitting and giving instructions, to practice their speaking and reading skills. 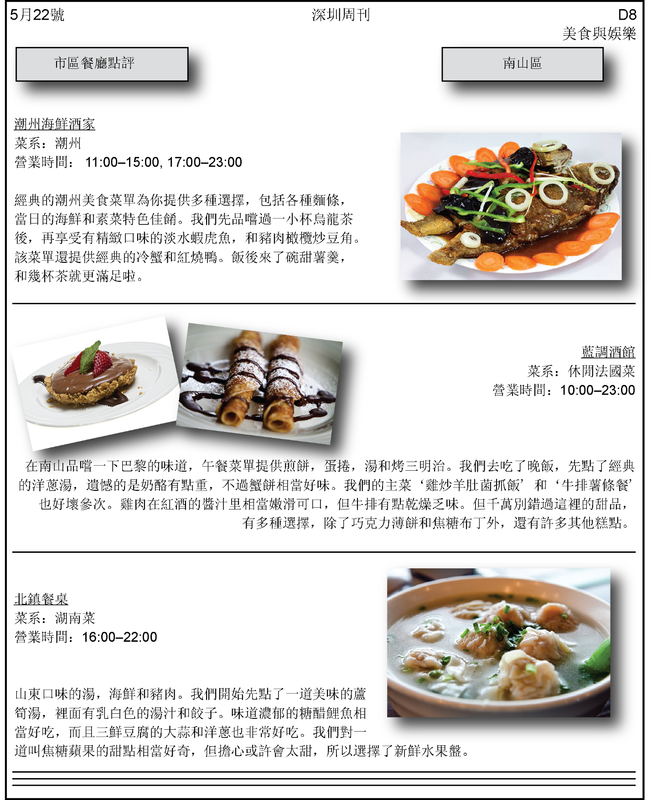 Then, I will ask one student in class the same four questions we did in the previous class, 你鍾意食咩菜? 你唔鐘意食咩菜? 你想唔想去食......菜? I will then take out the brochure (exhibit) and demonstrate how to expand the conversation to make an arrangement to have lunch or dinner together by asking what time should we meet? (你聽日得閒嗎? 我地一齊去食晚飯吖?) and which restaurant should we go to? (哩間法國餐廳睇落唔錯，我哋去試嚇吖？). Once the demonstration is done, I will ask everyone to pair up with a partner, and arrange a dining date together. I will give students fifteen minutes to practice, and then they will demonstrate their dialogues one pair at a time. The rationale of this activity is for students to use what they just learned in a simulated real-life situation so that they are ready for a future real-life similar situation. The following characteristics guide the scoring of responses to the Pedagogical Content Knowledge assignment. A score will be assigned to the response to the Pedagogical Content Knowledge assignment according to the following score scale. The "4" response reflects a thorough command of the relevant knowledge and skills. The "3" response reflects a general command of the relevant knowledge and skills. The "2" response reflects a partial command of the relevant knowledge and skills. The "1" response reflects little or no command of the relevant knowledge and skills. The response is unscorable because it is unrelated to the assigned topic or off-task, unreadable, written in a language other than English or contains an insufficient amount of original work to score.